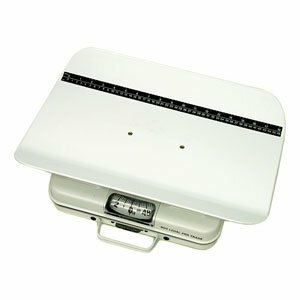 Portable baby scale with convenient carrying handle for easy transport. Easy-to-read angled dial. Weight Lock for error-proof reading after weight is removed. Sanitary tray provides safety. Sanitary tray is removable, made from easy-to-clean ABS plastic. Measuring tape (18"/46cm) included on tray. Protected zero adjust knob for easy access and to eliminate breakage. 1 Year Limited Warranty. Product Specifications: Capacity: 50 lb. Increment: 1/4 lb. Product Weight: 11 lb. Tray Dimensions: 19 1/4" x 12 3/4" x 2". Product Dimensions: 19 3/8" x 12 1/4" x 5 1/2". The product referenced on this detail page is sold be Each.